Jamshedpur Youth Chapter of the Initiatives of Change is taken care by an experienced and consistent team. It comprises of the most steadfast member of the Youth Team – Lalan Sharma, profound thinker Sanjay Kumar and enthusiast Rajiv Agarwal and his wife Shraddha Agarwal . These leaders along with an elder IofC team, are responsible for carrying out multifarious activities for IofC work. The IofC Jamshedpur Chapter has been functional for more than 15 years and continues to be a tireless effort by the young of minds and heart. In the team meetings, co-ordinated by all the leaders, everyone meets first Friday of the month in the IofC office allotted by Tata Foundation in the Centre of Excellence. This office is put to excellent use by the team to hold meetings and discuss about the activities to be carried out for the youth. In the One Day Seminars organized and executed by Mr. Lalan Sharma, youth are introduced to the power of RTI. They are enlightened by the positive outcomes of the use of this act as shared by Mr. Lalan. The best initiative by this team is the annual youth conference called "Savera". This conference is held in the Sep - Oct months of the year for the students of Class 8 – 12. This conference which is usually held for 3 days, introduces students to the concepts of IofC and Inner voice. They learn to practise quiet time and share within the intense Group Discussions. In these 3 days, students get a chance to mingle with other students of diverse backgrounds and are given a chance to think deeply of important things in their life. 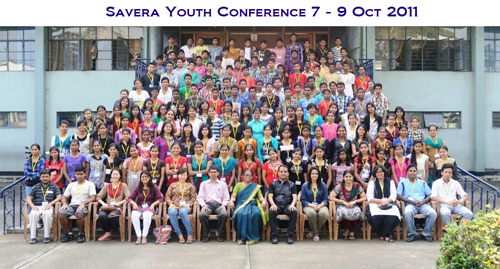 Many students who have attended Savera go and attend the Annual YC held in Panchgani every year.